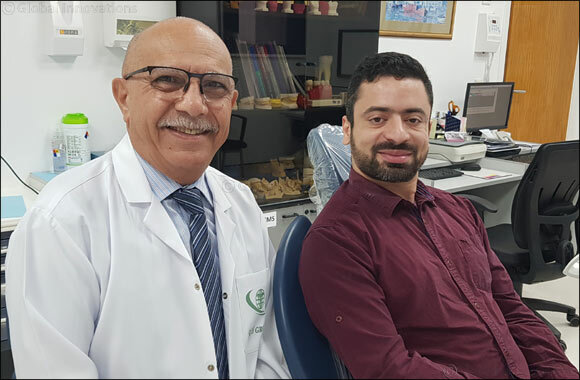 08 April 2019, Jeddah, Saudi Arabia: A Saudi patient with a devastating facial injury now feels like he has his life back on track thanks to life-changing surgery by Saudi German Hospital (SGH) in Jeddah. A 30-year-old patient was involved in a gardening accident with an electric chainsaw, which resulted in severe and catastrophic damage to his left side of his face: forehead, eye, middle face, cheek, chin, and neck. The injuries were very deep near to the base of his skull, facial bones, muscles, skin, and nerves. Bone of his left eye was completely detached from its place. After one day, and rejections from other hospitals due to the severity of the injuries, the patient visited Prof. Ibrahim Hashish, Head of Dental and Maxillofacial Center at SGH Jeddah. “In my forty years of work in maxillofacial injuries, I have only seen a case as severe as this a handful of times. At Saudi German Hospital, we have expertise in severe maxillofacial cases and felt it was our duty to help and support this man both mentally and physically. Following such a traumatic experience, it was vital to not only treat his injuries but offer emotional support in order to aid his recovery overall,” Prof. Hashish explains. When the patient first arrived at SGH Jeddah, Prof. Hashish and team firstly assessed the damage and prepared the patient for operation. In the operating room the team removed all the small pieces of crushed bone that had been left. They started to reassemble the bones and reconstructed the walls of the eye and zygoma, as well as reconstructing the upper jaw and fixing it with miniplates and screws, repairing all the way down to the cheek, chin, and the neck. The surgery took around 10 hours. After two to three weeks, the secretion of saliva stopped, and the first stage of treatment was complete; the patient was able to go home safe and comfortable and even returned to work. Next for the patient is the reopening of his scar to remove the plates and screws, smoothen the bones, finalize the curves and shapes of the bones in his face, and in the meantime, conduct scar corrections which will happen in the next few weeks. “As of right now the patient is very healthy and happy, and if in a year later there are any remnants or issues with scars then that would be the best time to correct it when the bone, muscles and skin are stable enough. Fortunately, for now, the patient is content with the result of the surgery, and he has been able to live his life normally, go to work, and even travel,” concludes Prof. Hashish.